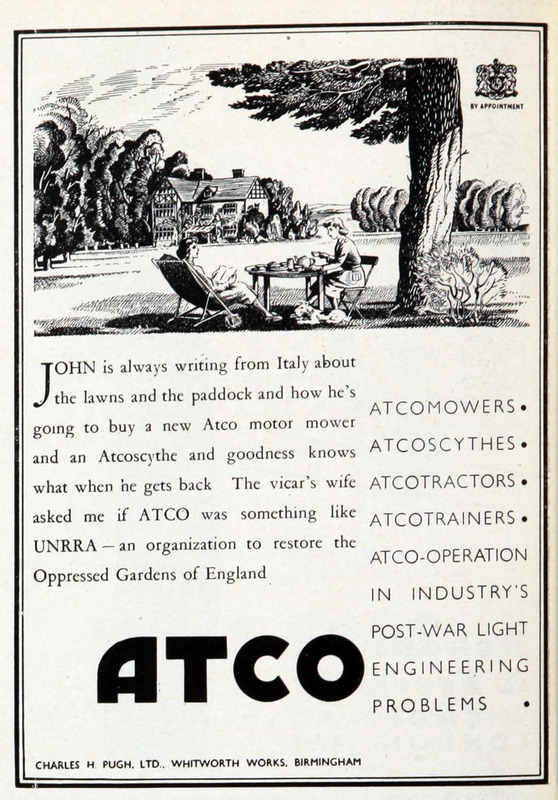 Company formed by Charles Henry Pugh, which later became known for its famous product, the Atco Mower, as well as the Senspray carburetter, and the Alfred Appleby Cycle Chain. Located in the Whitworth Works, previously home to the Whitworth Cycle Co. This company was best known as a successful manufacturer of small 'repetition' components. These were used extensively during the First World War on many items, including armaments. Post-WWI. Demand for products declined after the end of the war, so the company looked for new products and marketing opportunities. 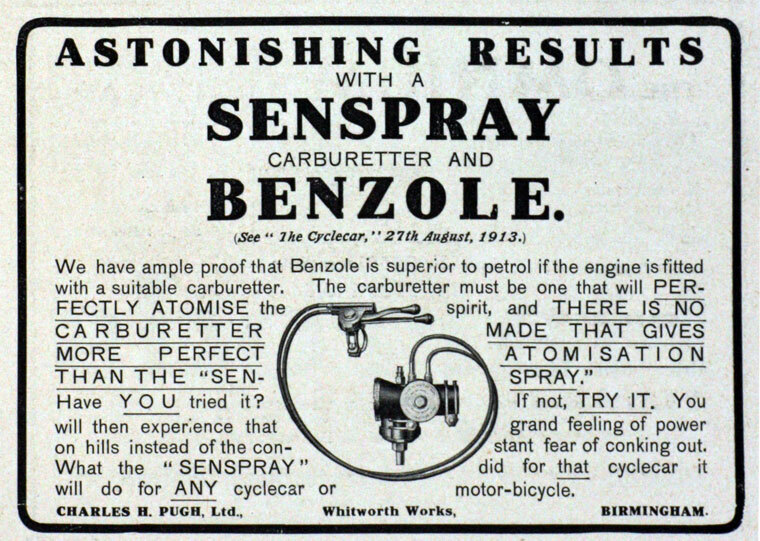 One of the first products was a carburettor known as the Senspray which was sold to engine manufacturers such as Villiers for use in motorcycles. Another product was Alfred Appleby Cycle Chain, "The Best Cycle Chain In The World". 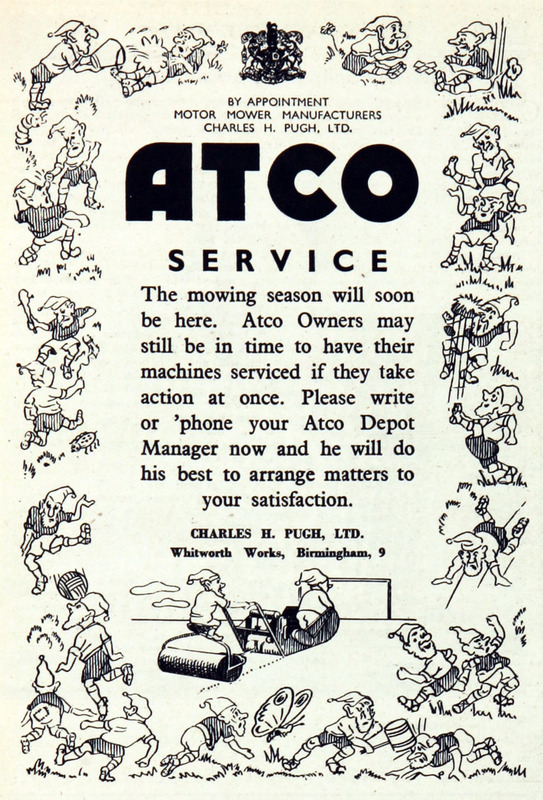 Faced with the need to cut the grass around the Atlas Chain Co's factory, Charles Vernon Pugh invented the 12 inch Atco Standard 9 Blade mower, the world' first mass produced petrol-engine powered mower. 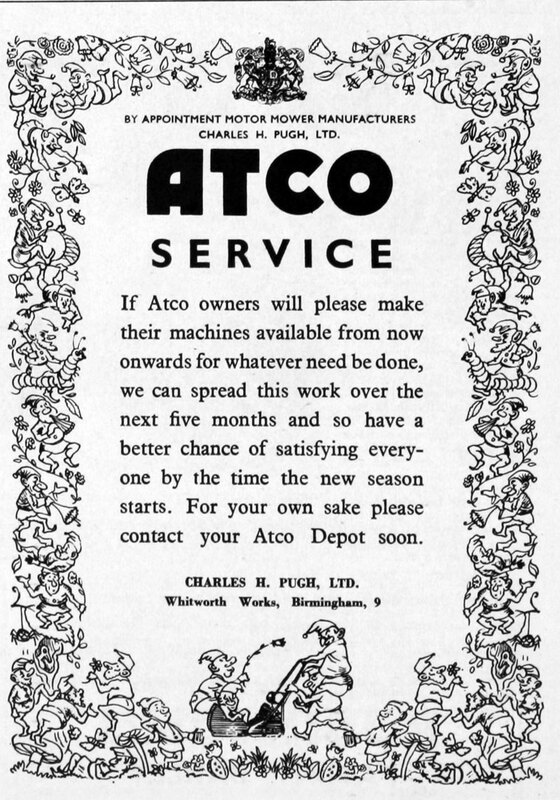 1921 The Atco machine was introduced, the first mower made by Charles H. Pugh Ltd. 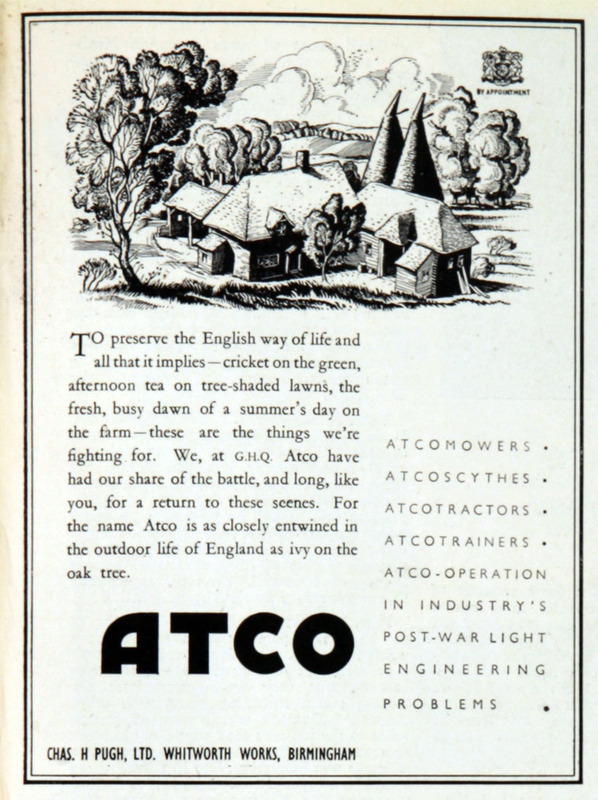 The name "Atco" came from the Atlas Chain Co, another company owned by Charles H. Pugh Ltd. The mower had several components already manufactured by the company, including Senspray carburettor and chain drive. By 1926, the company was producing tens of thousands of mowers annually. Prices reduced and a wide range of models arrived on the market. WWII. Part of the Atco factory at Hall Green manufactured munitions. Post-WWII. After the war, the Birmingham factory quadrupled in size. It was a growing period for domestic lawnmower manufacturers, as production and servicing of mowers increased. 1951 Several different types of products had been introduced - these ranged from powered auto-scythes to boat impellers, which found great popularity in the marsh-lands of Eastern Asia. 1951 Reverted to a public company. 1955/6 The company was granted a Royal Warrant for lawnmowers and tractors. This page was last edited on 23 January 2019, at 11:43.